It needs additional references or sources for verification. Tagged since November 2010. It may require general cleanup to meet Wikipedia's quality standards. Tagged since November 2010. Its lead section requires expansion. Tagged since November 2010. 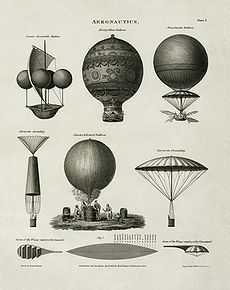 Picture - This 1818 technical illustration shows early balloon designs. The History of Ballooning, both with hot air and gas, spans many centuries. 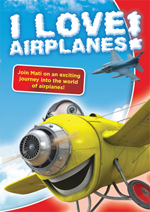 It includes many firsts, including the first human flight, first flight across the English Channel, first flight in North America, and first aircraft related disaster. 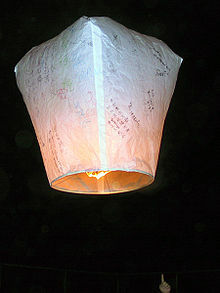 Picture - A Kongming lantern, the oldest type of hot air balloon. Unmanned hot air balloons are popular in Chinese history. Zhuge Liang of the Shu Han kingdom, in the Three Kingdoms era (220-280 AD) used airborne lanterns for military signaling. These lanterns are known as Kongming lanterns (孔明灯). There is also some speculation, from a demonstration led by British modern hot air balloonist Julian Nott in the late 1970s and again in 2003, that hot air balloons could have been used by people of the Nazca culture of Peru some 1500 to 2000 years ago, as a tool for designing the famous Nazca ground figures and lines. The first documented balloon flight in Europe was by the Portuguese priest Bartolomeu de Gusmx�o. On August 8, 1709, in Lisbon, Bartolomeu de Gusmx�o managed to lift a small balloon made of paper full of hot air about 4 meters in front of king John V and the Portuguese court. According to the Portuguese speaking community, this was the first man ever to fly in human history. However, this claim is not generally recognized by aviation historians outside the Portuguese speaking community, in particular the FAI. Following Henry Cavendish's 1766 work on hydrogen, and Robert Boyle's Boyle's Law which was published 100 years earlier in 1662, Joseph Black proposed that a balloon filled with hydrogen would be able to rise in the air. Professor Jacques Charles, having studied the work of Cavendish, Black and Tiberius Cavallo, conceived the idea that hydrogen would be a suitable lifting agent for balloons. Jacques Charles designed the hydrogen balloon, and the Robert brothers invented the methodology for constructing the lightweight, airtight gas bag. They dissolved rubber in a solution of turpentine and varnished the sheets of silk that were stitched together to make the main envelope. They used alternate strips of red and white silk, but the discolouration of the varnishing/rubberising process left a red and yellow result. Jacques Charles and the Robert brothers launched their balloon, the world's first hydrogen-filled balloon, on August 27, 1783, from the Champ de Mars (now the site of the Eiffel Tower); Benjamin Franklin was among the crowd of onlookers. The balloon was comparatively small, a 35 cubic metre sphere of rubberised silk, and only capable of lifting about 9 kg. It was filled with hydrogen that had been made by pouring nearly a quarter of a tonne of sulphuric acid onto half a tonne of scrap iron. The hydrogen gas was fed into the envelope via lead pipes; but as it was not passed through cold water, great difficulty was experienced in filling the balloon completely (the gas was hot when produced, but as it cooled in the balloon, it contracted). Daily progress bulletins were issued on the inflation; and the crowd was so great that on the 26th the balloon was moved secretly by night to the Champ de Mars, a distance of 4 kilometres. The balloon flew northwards for 45 minutes, pursued by chasers on horseback, and landed 21 kilometres away in the village of Gonesse where the reportedly terrified local peasants attacked it with pitchforks or knives and destroyed it. The project was funded by a subscription organised by Barth�l�my Faujas de Saint-Fond. 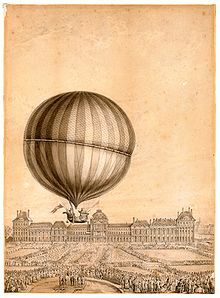 The first clearly recorded instance of a balloon carrying (human) passengers used hot air to generate buoyancy and was built by the brothers Joseph-Michel and Jacques-Etienne Montgolfier in Annonay, France. These brothers came from a family of paper manufacturers and had noticed ash rising in paper fires. The Montgolfier brothers gave their first public demonstration of their invention on June 4, 1783. 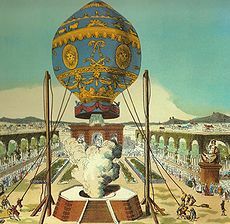 After experimenting with unmanned balloons and flights with animals, the first tethered balloon flight with humans on board took place on October 19, 1783 with the scientist Jean-Franx�ois Pilx�tre de Rozier, the manufacture manager, Jean-Baptiste R�veillon and Giroud de Villette, at the Folie Titon in Paris. 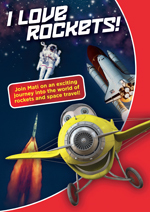 The first free flight with human passengers was on 21 November 1783. King Louis XVI had originally decreed that condemned criminals would be the first pilots, but de Rozier, along with the Marquis Franx�ois d'Arlandes, successfully petitioned for the honor. The first hot air balloons were essentially cloth bags (sometimes lined with paper) with a smoky fire built on a grill attached to the bottom. 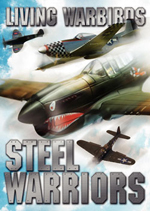 They were susceptible to catching fire, often upon landing, although this occurred infrequently. The pioneering work of the Montgolfier brothers in developing the hot air balloon was recognised by this type of balloon being named Montgolfix�re after them. Only a few days later, at 13:45 on December 1, 1783, professor Jacques Charles and the Robert brothers (Les Frx�res Robert) launched a new, manned hydrogen balloon from the Jardin des Tuileries in Paris, amid vast crowds and excitement. The balloon was held on ropes and led to its final launch place by four of the leading noblemen in France, the Marechal de Richelieu, Marshal de Biron, the Bailiff of Suffren, and the Duke of Chaulnes. Jacques Charles was accompanied by Nicolas-Louis Robert as co-pilot of the 380-cubic-metre, hydrogen-filled balloon. The envelope was fitted with a hydrogen release valve, and was covered with a net from which the basket was suspended. Sand ballast was used to control altitude. They ascended to a height of about 1,800 feet (550 m) and landed at sunset in Nesles-la-Vall�e after a flight of 2 hours and 5 minutes, covering 36 km. The chasers on horseback, who were led by the Duc de Chartres, held down the craft while both Charles and Robert alighted. Charles then decided to ascend again, but alone this time because the balloon had lost some of its hydrogen. This time he ascended rapidly to an altitude of about 3,000 metres), where he saw the sun again. He began suffering from aching pain in his ears so he 'valved' to release gas, and descended to land gently about 3 km away at Tour du Lay. Unlike the Robert brothers, Charles never flew again, although a balloon using hydrogen for its lift came to be called a Charlix�re in his honour. Charles and Robert carried a barometer and a thermometer to measure the pressure and the temperature of the air, making this not only the first manned hydrogen balloon flight, but also the first balloon flight to provide meteorological measurements of the atmosphere above the Earth's surface. Picture - Balloon landing in Mashgh square, Iran (Persia), at the time of Nasser al-Din Shah Qajar, around 1850. The next great challenge was to fly across the English Channel, a feat accomplished on January 7, 1785 by Jean-Pierre Blanchard. Blanchard went on to make the first manned flight of a balloon in America on January 9, 1793. His hydrogen-filled balloon took off from a prison yard in Philadelphia, Pennsylvania. The flight reached 5,800 feet (1,770 m) and landed in Gloucester County, New Jersey. President George Washington was among the guests observing the takeoff. The first steerable balloon (also known as a dirigible) was flown by Henri Giffard in 1852. Powered by a steam engine, it was too slow to be effective. Like heavier than air flight, the internal combustion engine made dirigibles-especially blimps-practical, starting in the late 19th century. In 1872 Paul Haenlein flew the first (tethered) internal combustion motor-powered balloon. The first to fly in an untethered airship powered by an internal combustion engine was Alberto Santos Dumont in 1898. Henri Giffard also developed a tethered balloon for passengers in 1878 in the Tuileries Garden in Paris. The first attempt at ballooning in England was by Signor Vincent Lunardi who ascended from Moorfields (London) in 15 September 1784. Jean-Pierre Blanchard and Jeffries flew from Dover to Calais in 1785. In the same year, a Mr Arnold went up from St Georges Fields (London), but came down in the River Thames, and a Major John Money (1752-1817) took off from Norwich, in an attempt to raise money for the Norfolk and Norwich Hospital. He passed over Lowestoft at 6pm and came down about 18 miles (29 km) into the North Sea and was saved by a revenue cutter about five hours later. The first ascent in Ireland was from Ranaleigh Gardens in Dublin in 1785. James Sadler made many flights in England, but on 9 October 1812 he came down in the sea and was rescued near Holyhead. His son, Windham Sadler was killed when he fell from a balloon in 1825. A Mr Charles Green first ascended on July 19, 1821. Lieutenant Harris was killed falling from a balloon on 25 May 1824. Charles Green and others made a number of ascents in London between 1821 and 1852. He claimed that in May 1828 he actually took his horse up with him but this was disputed, and the public had to wait until July 1850 when he lifted off from Vauxhall Gardens with a somewhat diminutive pony as his "steed". Further attempts were made in France until Madame Poitevin took off from Cremorne Gardens in London in August 1852, as "Europa on a Bull" (the bull dressed as rather a nervous "Zeus") but this led to a charge of cruelty to animals, a police case, a diplomatic dilemma and general public outrage after which no animals were used. 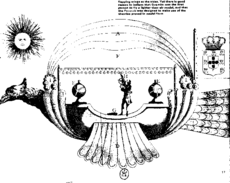 Robert Cocking, an artist, devised a parachute based upon Garnerin’s prototype (in which he had great faith) and ascended in a balloon from Vauxhall (London) on 24 July 1837 to about 1500m. The parachute failed to open properly and Cocking was killed. The first military use of aircraft in Europe took place during the French Revolutionary Wars, when the French used a tethered hydrogen balloon to observe the movements of the Austrian army during the Battle of Fleurus (1794). In 1811 Franz Leppich went to Napoleon and claimed that he could build a hot-air balloon that would enable the French to attack from the air. Napoleon then ordered that he be removed from French Territory. In 1812 he went to Moscow to Count Rostopchin with the same proposal. When the balloon was finally tried out, it failed to rise, and nothing more was seen of its inventor. In Tolstoy's novel, War and Peace, Count Pyx�tr Kirx�llovich Bezx�khov (Pierre) makes an excursion to see this balloon though he does not see it. Tolstoy also includes a letter from the sovereign Emperor Alexander I to Count Rostopchin concerning the balloon. Picture - Gas balloons in 1919. Hot air balloons were employed during the American Civil War. 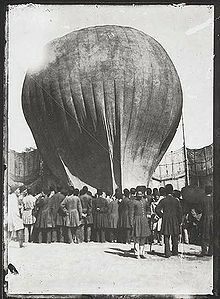 The military balloons used by the Union Army Balloon Corps under the command of Prof. Thaddeus S. C. Lowe were limp silk envelopes inflated with coal gas (town gas) or hydrogen. During World War II, a large number of Barrage Balloons were inflated over the city of London in an effort to obstruct Luftwaffe air attacks during the Battle of Britain. 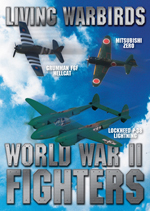 Whatever their effectiveness, they were a cheap defense but did not stop heavy damage inflicted on Londoners during the Blitz, probably because the Heinkel He 111 bombers flew too high. Nonetheless, some 231 V1 rockets were destroyed. In the early and mid-20th century, hydrogen balloons were used extensively in upper-atmosphere research in such projects as Osoaviakhim-1, the Stratobowl launches, Project Manhigh, and Project Strato-Lab. A series of ascensions set a number of high-altitude records before space flight eclipsed ballooning as an endeavor. When governments lost interest in manned balloons, private citizens continued to strive to set records, especially for long distances, and to achieve "first" marks (such as Double Eagle II (first to cross the Atlantic Ocean) and Breitling Orbiter 3 (first to circumnavigate the world). Although manned high-altitude balloon ascensions are still undertaken, they are more likely to be the work of adventurers than researchers. Picture - A pair of Hopper balloons. Modern hot air balloons, with an onboard heat source, were pioneered by Ed Yost beginning in the 1950s which resulted in his first successful flight on October 22, 1960. 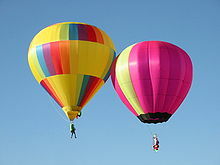 The first modern day hot air balloon to be built in the United Kingdom (UK) was the Bristol Belle in 1967. Today, hot air balloons are used primarily for recreation, and there are some 7,500 hot air balloons operating in the United States. The first tethered balloon in modern times was made in France at Chantilly Castle in 1994 by A�rophile SA.